Door entry systems installed by Goodwin Electrical in Plymouth are suitable for just about any project for offices, apartments, flats, schools are many more. You have the control to allow access via telephone, key fob, pass code and mobile phone. 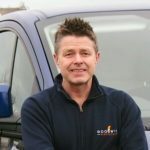 We install robust systems which can handle all environments at a great price to meet all your needs. Our recent project was to install a door entry system with two phones and one door key pad at Young Devon’s Head office in Ivybridge near Plymouth. This has the ability to act as door bell with communication to the offices who then decide to allow access with the push of a button on the phone, this releases the front door lock. 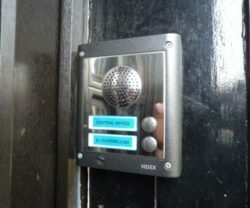 This is the VIDEX audio entry door station which is available with up to 12 call buttons, each with a back lit name plate.